Hosting a successful morning show is far more than great benchmarks and show prep. Elvis Duran used his WHTZ (Z100)/New York show to build a foundation for national syndication and his own production company, which has put together the Art Carney Awards for character actors and now, fantasy sports operation Sports Grid. 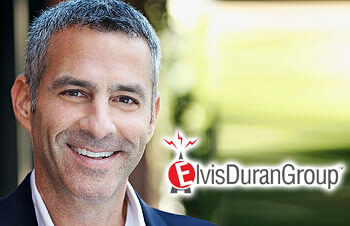 Here, Elvis Duran Group Partner/CEO David Katz discusses how Elvis is able to maintain a successful nationally syndicated radio show while exploring and capitalizing on new ventures. The last time we talked was five years ago. How has The Elvis Duran Group evolved over time? The company has gone in the right direction. I would like to say it has grown beyond our wildest dreams, but frankly what we've done is create a nice little business that has given us the opportunity to continue to get involved with more projects that we like. Ultimately we've been successful enough in our core business to give us the opportunity to chase things on the outside, so we're doing exactly what we wanted to do. Is it more the company being offered potential projects, or are you looking to find or start your own? Probably more of the former. We're in an enviable position because of what Elvis represents and what he has done. Folks keep contacting us with projects and ideas ... and we listen to everything. Elvis has been wonderful in picking and choosing the projects that can be done within the limited time and obligations he has. He only pursues ones he has a genuine interest in doing. On the other side, we like to go out and explore, develop and pitch our own projects, too. In fact, we have been exploring getting into the Fantasy Sports industry and after two years of due diligence, we've officially announced our venture into the $26 billion industry. Your partnership with SportsGrid has gotten a lot of attention. What made this venture stand out to you? The fact that 60 million people play fantasy sports and spend $26 billion annually in and of itself is noteworthy and I count myself as one of those people. I've been playing fantasy sports for the last 25 years. I get the obsession and need for this kind of information and entertainment. Elvis has also seen the growth and fanaticism through his audience and his cast mates, so he gets it as well. lHaving the opportunity to program, market, sell, distribute and create audio/visual content in this space is exciting and smart. SportsGrid is the best in this industry, making them ideal to partner with. Was this project in the works before the Supreme Court ruled that states could determine the legality of sports gambling? Yes; we were excited enough before that happened, but now these already ridiculous numbers of players and revenue will increase dramatically. In fact, the American Gaming Association did a survey that found more than 28 million Americans are more likely to wager on sports in a legal environment. Elvis has also been integrating a new co-host into the morning show. How has that impacted The Elvis Duran Group's work? It really hasn't impacted the company because the new hire is all on Elvis' team. He has surrounded himself with the right mix of people to keep the show running smoothly. I'm just a very interested observer on the periphery. Anytime there's a departure of someone from the show, the first thought is sadness. But it soon goes from a negative to a positive because he and his team have consistently used those moments as a catalyst to refresh the show. Every time that has happened, Elvis has managed the transitions extremely well. His longevity and success are a testament to that. There have been a few of them. Carolina was the first one, followed by TJ and Lauren. Carolina, for example, had radio experience prior to Elvis; he gave her the opportunity to pursue TV, then she came back to radio. TJ and Lauren, on the other hand, basically grew up on the show. They left five to six years ago to start their own morning show in Boston. That led to Carla Marie, an intern from a New Jersey college who also grew up on the show, and Anthony, who started as Elvis' assistant, getting experience and an opportunity on the show, which they parlayed into their own show in Seattle. What Elvis does so well is corral all these different people and incorporate them into the show. I know I've lamented about a lack of a farm system when it comes to developing radio professionals and wish radio would have a better system, but Elvis' show has become an amazing platform and farm system for the next generation of radio stars. I wish more shows and companies would look to their own big, successful shows as a farm system for new talent. Have you or Elvis ever considered making on-air talent development and representation a part of the company? We're basically focused on the world of Elvis, but there are some people Elvis and I support and if we can help, we'll work with them in whatever capacity possible. Certainly with my years as an agent, I know we could get into it if we wanted to, but I think we prefer dabbling with other talent. We might do something with someone here and there, but anything we do won't interfere with our work or his core show. Doing a successful morning show is a yeoman's job in itself, let alone making the extra effort to optimize syndication. Yet Elvis also finds time for TV projects such as The Carney Awards. How does he deal with the challenge of time management? The easy answer is that it's Elvis being Elvis. I don't know how he does it, and I don't know anybody who knows how he does it. Elvis has the most capacity for energy that I've ever seen, up close and personal, and obviously he thrives on it. Elvis produced The Carney Awards, but he refrained from hosting it. Will all of his non-radio show projects have him behind the scenes and not in front of the camera? He'll be in front of the cameras if and when he's interested in doing so and it's appropriate for the project. We've had Fred Willard, Tom Bergeron and Patton Oswalt as hosts so far. As a producer, Elvis was thrilled to be able to bring in that level of talent to host. He genuinely enjoys running a company that produces and finances projects likes this. This goes back to our core business, which has been successful enough to enable us to get behind particular projects like this that aren't inexpensive to do. The Carneys were years and years in the making. We've done the show for four years with the last two televised. Our mission is to honor Hollywood's leading character actors for their outstanding achievements and to be in that audience last year and have Harrison Ford walk out on that stage, it builds a credibility for this tiny little show we've been championing. It doesn't get any better than that. Are you concerned about having so many projects, Elvis may not have the time to do all he wants to do with the radio show? No, because it's always radio first. I used to work for Don Buchwald, and I saw and heard about how they proceeded and progressed with Howard Stern ... and the core principle was to always take care of the mothership. Nothing is more important than the morning radio program. And no matter what we get involved with - all the other things he does - all the company's efforts are done in relation to what we do on the morning show. Regarding future TV ventures, do you expect Elvis to stay behind the scenes or inevitably be in front of the camera in some way? He'll do both. Elvis enjoys the time he has spent on the Today Show, and a production company is putting together a music interview show called "12 on 12," and if that gets picked up, we'll certainly see him host the show because he enjoys doing it. If a new opportunity came up to host a TV show or be part of the project where he needs to be an active participant behind the scenes, he'll weigh both strongly - but again, his primary commitment remains the radio show. Considering all that he's doing, it's almost as if Elvis would be the perfect candidate for his own reality TV show. I'd like to think the answer to that is "no." Nothing is worth ruining your social life - unless you're in your 20s and 30s, I don't think anything is worth putting Elvis' privacy at stake for his career. Is there a competitive streak with Elvis and you in terms of competing with the projects other morning stars' companies get involved with, be it Ryan Seacrest or the late Kidd Kraddick's Yea Network? Not at all. And that fact that we refuse to compete against them is not a negative or a sign of weakness. We're competing with ourselves to make our product as good as possible. We hope that the success of each project continues to help us get behind other projects. But I can assure you in no uncertain terms that when Elvis discusses potential ideas and projects, I never once recall him saying, "We should be doing what Seacrest is doing." We don't think that way because doing it that way does not make what we do better. Are you looking into more podcasting/digital ventures? As a company, we're not looking into it, but a lot of folks around Elvis and the show have podcasts. Clearly podcasting has been in the news and we're beginning to hear of potential deals, but I don't think we're sitting here thinking that we have to get into podcasting. Frankly, nothing is bigger than our current platform and the show. With that said, if an opportunity comes our way, be it from a podcasting company or a person who we're turned on to ... if something like that comes our way, as we do with everything else, we'll look at it closely. We're fortunate to be able to pick and choose. You mentioned that you're regularly offered projects for Elvis to get behind. What has been the wildest pitch so far? I don't think we've had one of those moments. As you would imagine, we're getting a healthy amount of door knocks asking Elvis to host things; most of them have been music-related or interview shows. Nothing really out of the ordinary, unless you consider being asked to host a TV version of the game Monopoly, which he was offered a few years ago. They offered to fly him out to Vegas to shoot it over eight consecutive weekends in the course of a year, and Elvis, rightly so, didn't want give up that time. The gig ended up going to the guy who played the husband on Mike and Molly. In this day and age, do you feel somewhat constricted in experimenting with things because you essentially can't do anything that might damage "the brand?" We have no choice, but I'm not saying that sadly. Elvis Duran is the brand, and he knows his brand better than anybody. And I know we're not going to do anything that could possibly affect the brand in a bad way. Every decision we make - and he makes - is based on whether the project is in line with his brand, and that it wouldn't sully it. You wouldn't ordinarily think the Carney Awards fits his brand, but the reality is that a TV show about interesting movie characters caters to adults who would like Elvis. It's good programming, and there's always a need for it ... something that's wholesome, but still fun and creative. That's who Elvis is and what he likes to do, not only in his radio show, but in everything he does. The brand is always important to him. How do you view the company's future ... do you have long-range plans or are you more focused on the immediate outlook? We take it one step at a time, period. For me, I want to be here as long as Elvis wants me to be here. I have no doubt that someday he will want to slow down - and when he does, I and the Elvis Duran Group will be happy to slow down with him. I certainly hope that won't be for a whole bunch of years, because we've enjoyed what we've done as long as I've known him. He needs to enjoy what he does -- and when he stops enjoying this, he'll stop doing it. Until then, I hope to continue to play in whatever sandbox he gives me.